The Queen in the award winning garden. They did it! 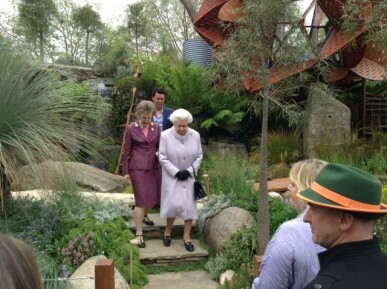 For the first time in 100 years Australians have won best in show at the Chelsea Flower Show. 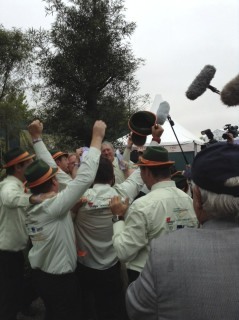 I am so thrilled that Wes Fleming and his team have finally achieved the “Impossible Dream” and done so well. And I love the garden with which they won it. Phillip Johnson’s designs have been inspiring me for years, exuberant and original and even from a distance it was clear that these values shone through to the judges. Along with mentoring secondary students looking at a future in hospitality, chef and owner of Jack & Jill restaurant in Geelong Vic. Leonie Mills was eager to inspire and educate even younger palates to the delights of fresh fruit and vegetables. 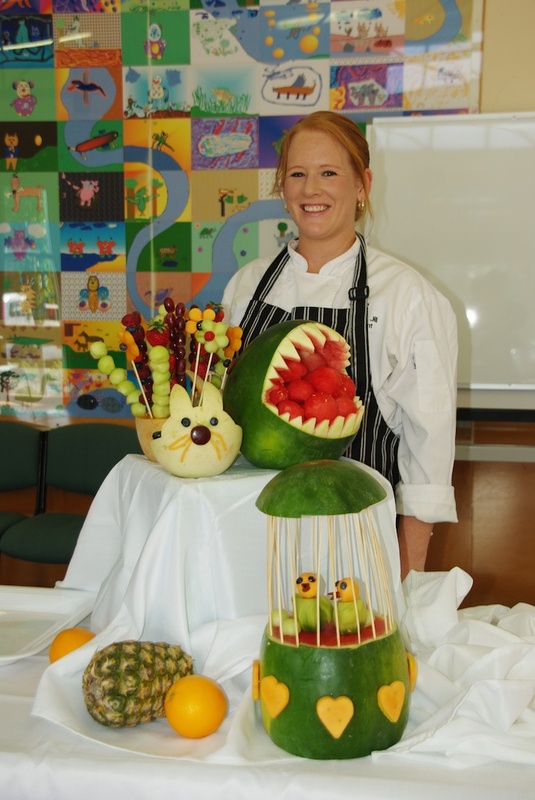 “I wanted something that was fun for primary groups so I’ve developed a program ‘Leonie’s Fruit Art for Kids’,” enthuses Leonie who generously gives of her time taking the program into local schools. With local fruiterer Harvey’s of Highton supplying the ingredients, Leonie’s buffet of imaginatively carved produce including watermelon sharks, fruit salad trains, rabbits, ducks and floral arrangements immediately grabs the youngsters’ attention and in no time they are excited to try the array of new taste sensations. With great excitement I’ve been following the construction of the Phillip Johnson garden at this year’s Chelsea Flower Show. 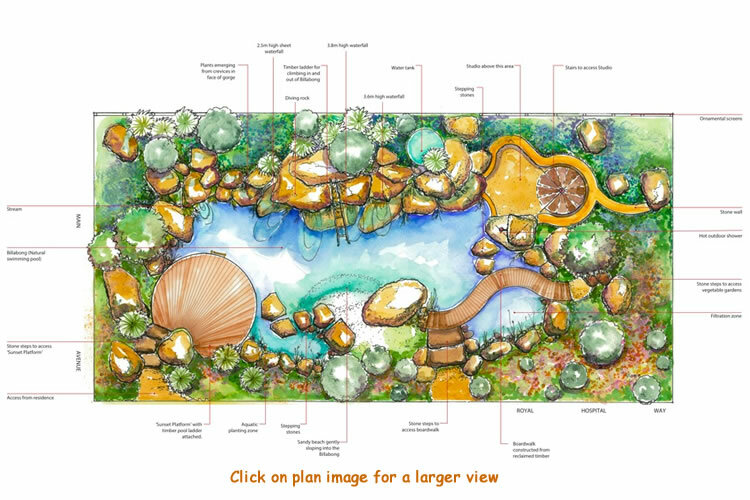 Once again (and apparently for the last time) Wes Fleming and Flemings Nursery is sponsoring and building a show garden at Chelsea. It is wonderful looking at some of the slide shows and video clips and seeing the passion and dedication of the whole crew, but of Wes Fleming and Phillip Johnson in particular. 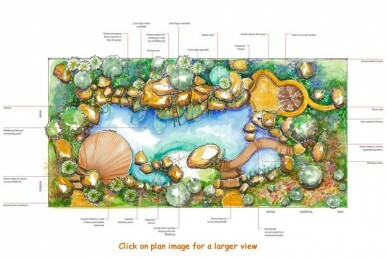 Phillip Johnson of Phillip Johnson Landscapes, has designed a garden that is a showcase of Australia’s natural beauty. It is crafted to demonstrate the seamless transition between house and garden, and aims to challenge conventional garden design while incorporating best environmental practice in urban surrounds. Key features of the garden include a substantial billabong fed by a series of waterfalls, cascading over a huge stone gorge, which forms a breathtaking foundation for an architecturally designed studio. 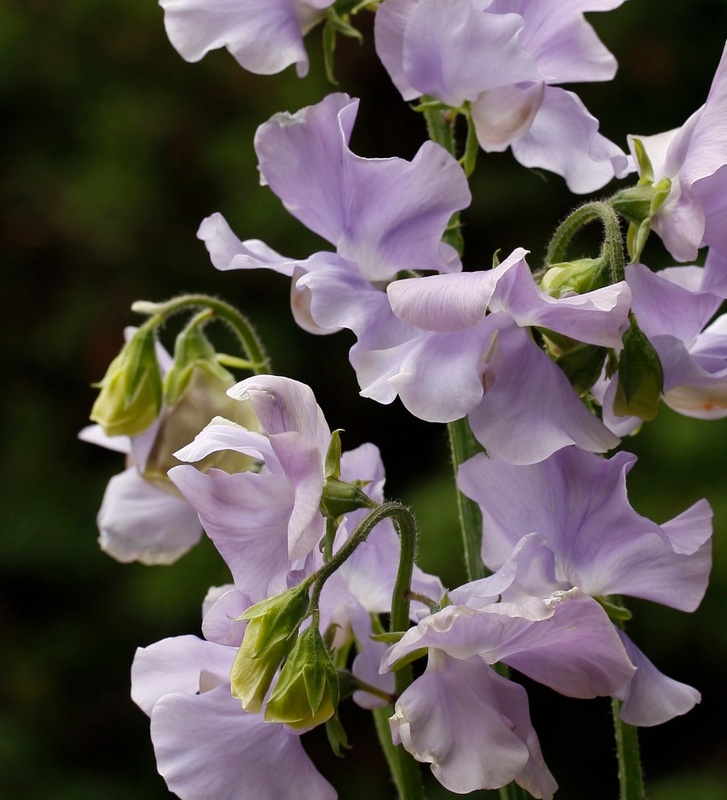 I’ve never been any good at growing sweet peas, so I asked my friend to write about them for me. RELAX. You don’t have to do what the Vatican says, therefore St Patrick can safely be ignored on the matter of when to plant your sweet peas. And 2013 is definitely the year of the sweet pea, according to NZ breeder Dr Keith Hammett, who recently visited Melbourne.